This anthology, spanning nearly forty years of criticism, embodies the wide range of opinions evoked by the writings of Howard Phillips Lovecraft. Originally published in pulp magazines, which in the early part of this century were the only market for fantasy fiction, H.P. Lovecraft’s works were not recognized by the literary world in his lifetime. After Lovecraft’s death, associates and fans published his work in book form, thus beginning his slow rise from obscurity. Since that time, critical acceptance of Lovecraft’s works has fluctuated greatly, from those who feel that his work is juvenile and undeserving of serious study to those who consider him to be another Poe. 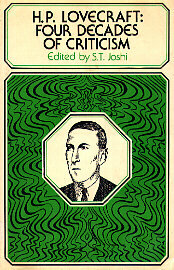 In addition to representing the ambivalent critical responses to Lovecraft’s writings, this volume also examines the literary influences that affected him, his poetry and essays, his work as a regional and local-color writer, and the evolution of his vast pseudo-mythology in both his writings and the writings of others, as well as his reactions to the political and economic development of his time. Above all, this volume is designed to present Lovecraft to the academic world which has virtually ignored him for forty years, capping his metamorphosis from a forgotten pulp writer to a brilliant fantaisiste with a worldwide following. H.P. Lovecraft: Four Decades of Criticism. Edited by S.T. Joshi. Athens, OH: Ohio State University Press; 1980; ISBN 0-8214-0442-3 (cloth), 0-8214-0577-2 (paper). This book may be purchased in hardcover from Amazon.com or Barnes & Noble or in paperback from Amazon.com or Barnes & Noble.